Hi! 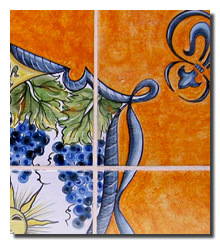 I am proud to provide an assortment of handmade Maiolica, also called Majolica, for the kitchen and home. 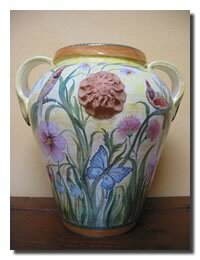 I am an Italian, trained in the Italian Maiolica tradition, and use traditional Italian Glazes to make unique modern Maiolica. All my products are hand formed and hand painted. My creations exhibit flair in both shape and design. My designs are unique and range from geometrical to floral. Some of my ceramic vessels have a whimsical tilt that provides movement. Custom pieces are my specialty. I very much enjoy working with clients to realize their ideas within the bounds of their requirements. THE SITE IS CURRENTLY UNDER CONSTRUCTION!